The An-Nur Jamek Mosque or Masjid Jamek An-Nur (or sometimes called Masjid Negeri Wilayah Persekutuan Labuan or State Federal Territory of Labuan Mosque) is the only mosque in the Federal Territory of Labuan, Malaysia. The initial stage of construction of this mosque was run by Sabah State Government through the Sabah Islamic Religious Council (MUIS). The mosque was opened on 1 February 1988 by the eighth Yang di-Pertuan Agong, Sultan Iskandar of Johor in conjunction with the Federal Territory Day. The combination architecture are from Brunei Malay architectural elements mix with the Turkish architecture. As a result of these two influences has produced a new mosque has a unique identity and beautiful.The mosque is equipped with a dome-shaped dome and two tall towers on both sides of the mosque and also equipped with a number of facilities and equipment for public use such as three lecture halls, Darul Hikmah Library, administrative offices and a break room for VIPs. 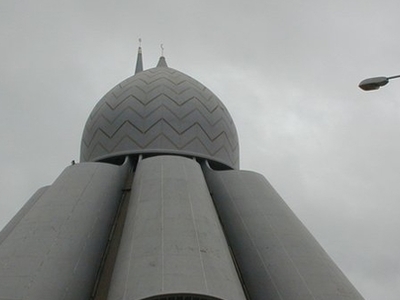 Here's the our members favorite photos of "Mosques near Labuan". Upload your photo of An-Nur Jamek Mosque!